dsjv :: Deep South Jewish Voice: Israel File :: Could Olmert Probe Derail Peace Process? Israel File :: Could Olmert Probe Derail Peace Process? Prime Minister Ehud Olmert appeared to be making progress on several fronts in the peace process before the latest corruption story broke. JERUSALEM (JTA) -- The corruption investigation of Prime Minister Ehud Olmert, which is threatening to bring down the Israeli government, potentially may have far-reaching consequences for Middle East peacemaking. The contours of the probe against Olmert are still unclear. After questioning Olmert and his longtime former bureau chief, Shula Zaken, multiple times, police requested court permission to take testimony under oath from a foreign citizen currently visiting Israel. A strict gag order prevented the disclosure of the allegations against the prime minister or the foreigner's identity, but the New York Post identified him as Morris Talansky, an American businessman from Long Island, N.Y. In the meantime, police and political officials are saying that the allegations, if true, could spell the end of Olmert's political career. The latest corruption affair surfaced May 2 as Olmert seemed to be making significant diplomatic progress on three fronts: negotiations with Palestinian Authority President Mahmoud Abbas’ moderate government in the West Bank on an Israeli-Palestinian peace deal; an Egyptian-mediated cease-fire between Israel and Hamas in the Gaza Strip; and the reopening of peace talks with Syria following an intensive Turkish mediation effort. But if Olmert is forced to step down, Israel will be thrown into a maelstrom of political uncertainty, potentially freezing peacemaking efforts for months. If the political turmoil results in an early election, peacemaking in its current form could cease altogether if, as polls suggest, the Likud Party's Benjamin Netanyahu wins the election. New signs of progress appeared on the Palestinian track before the dramatic news of the investigation of Olmert broke. In the run-up to a meeting Monday with Olmert, Abbas declared that some 80 percent of peace-related differences with the Israelis had been resolved. Egyptian Foreign Minister Ahmad Abul Gheit echoed that claim, insisting the two sides keep Egypt and other key players abreast of progress he said was being made. After the Olmert-Abbas meeting, the Israeli side was even more effusive. "The discussions are probably the most serious ever to be held between Israeli and Palestinian leaders," Mark Regev, a spokesman for the prime minister, told JTA. Significant progress had been made on delineating borders and security arrangements between Israel and a future Palestinian state, other officials said. Although no maps have been made public, the officials estimated that Israel’s withdrawal to the new borders would entail the evacuation of 60,000 of the 250,000 Jewish settlers in the West Bank. Regev, however, added a caveat: "Nothing is agreed until everything is agreed. For example, if one side has made a move on one issue, it is conditional on the other side moving on something else." In other words, Israel sees a deal on the four core issues -- borders, security, Jerusalem and Palestinian refugees -- as a package, and if Israel has been generous on one, it will expect Palestinian concessions down the road on another. Some right-wing Israeli politicians doubt whether the claimed progress is genuine and see it as nothing more than spin to help the beleaguered prime minister. 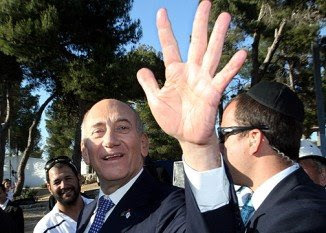 Others fear Olmert may be selling out Israel as part of a desperate attempt to save his skin. Even in Olmert's own Kadima Party, legislators have their doubts about the prime minister. "If it transpires that the various affairs have had a direct or indirect influence on the substance of the negotiations, any agreements that may have been reached will be null and void," Kadima legislator Otniel Shneller told JTA. If it becomes clear that Olmert is about to be indicted on corruption charges, Israeli law allows him the option of declaring himself temporarily unable to do his job and to take a leave of absence. In that case his deputy, Foreign Minister Tzipi Livni, would take over as acting prime minister for 100 days. As far as the various peace tracks are concerned, this would be a relatively seamless transition. Though Livni theoretically could form a new coalition in the current parliament after the 100 days are up, that road is fraught with political difficulties. Labor leader Ehud Barak might not want Livni to gain credibility as a bona fide prime ministerial candidate ahead of the next elections, and neither will Netanyahu. The smart money in the Knesset is saying that the smell of new elections already is in the air, with politicians and pundits talking about a date sometime in November. If that happens, Barak and Livni probably will both paint Netanyahu as likely to destroy the peace process and trigger new regional violence. But unless a sea change in public opinion occurs, Netanyahu probably would capture the office of prime minister. Should that happen, all Middle East peace tracks would be reassessed. Netanyahu is convinced that a peace deal with Abbas’ Palestinian moderates would do more harm than good. He warns that an Israeli withdrawal from the West Bank would lead quickly to a Hamas takeover of the territory, and Hamas terrorists then could fire rockets at strategic targets like Ben Gurion Airport, Jerusalem and central Tel Aviv rather than just the southern town of Sderot. Israel would find itself surrounded on all sides -- from Gaza, the West Bank and Lebanon -- by Iranian proxies. To prevent that, Netanyahu likely would look for a modus vivendi, based on economic cooperation with Palestinian moderates, that leaves the Israeli army in control of most of the West Bank. "I am for promoting economic peace while keeping security in our hands," Netanyahu declared in an interview Monday in the Israeli daily newspaper Yisrael Hayom. As for Gaza, Netanyahu regards a cease-fire as the worst possible option for Israel because it would enable Hamas to build its military power on the model of Lebanon’s Hezbollah. Instead, he says Israel must take action to smash the Hamas military machine. The main thrust of Netanyahu's regional policy probably would be to break what he sees as Iran’s stranglehold on Israel. That could mean Israel trying to initiate tougher diplomatic sanctions on Iran, but possibly also pre-emptive strikes against Hamas, Hezbollah and maybe even Iran itself. In 2005, Netanyahu left then-Prime Minister Ariel Sharon's government precisely because he believed the Gaza withdrawal would lead to a tightening of the Iranian noose around Israel. On Syria, Netanyahu argues that if Israel returned the Golan Heights, the Golan simply would become an Iranian forward base. Over the past few weeks, Netanyahu repeatedly has said that his own peace feelers with Syria – conducted by U.S. multimillionaire Ronald Lauder when Netanyahu was prime minister in the late 1990s – broke down because Netanyahu refused to withdraw from the heights. If Netanyahu were to come to power at Kadima's expense, the political wheel in Israel would have come full circle. Sharon and Olmert broke away from Likud in 2005 to build the political platform for a withdrawal to defensible borders and an end to the occupation of Palestinian-populated territory. Netanyahu almost certainly would reverse that process.